(MoneyWatch) Helaine Olen's new book, "Pound Foolish - Exposing the Dark Side of the Personal Finance Industry," takes the gloves off in a harshly unvarnished assessment of my fellow financial advisors and the financial services industry as a whole. "Pound Foolish" is sans any sugar-coating and, much as I wish it weren't so, I happen to think she is spot on. I recently spoke with Ms. Olen, and here are some key take-aways from the book, as well as my thoughts. According to Olen, we've all been sold on a fantasy that the personal finance industry possesses an ability, bordering on a superpower, that will help us all realize our dreams. Forget about Disneyland, it's apparently Wall Street that is the most magical place on Earth. But the reality is far more mercenary. As it happens, planners, institutions and media gurus aren't in the dream-fulfillment business, they are in the profit business. Unfortunately for consumers, that profit often comes from their misfortune. Say it ain't so, Suze! Take Suze Orman: Her advice has been lucrative for one person -- Suze Orman. Suze, Inc.-branded products, from credit cards to investment newsletters, have been more than a bit misleading to consumers. Dave Ramsey is no better with his soothing, simplistic message that you can be born again - this time without debt. Magic! However, it's a bit easier to say you're not going to participate in the economic downturn, but a heck of a lot harder to live if you've lost your job. All of this is to sell financial peace courses and refer to his network of ELPs (endorsed local providers). Olen cites a source as stating that Ramsey's organization spends five minutes with the provider before approving. This one surprised me as I assumed only the $1,000 monthly check was required. Next come the accusations that financial advisors would merely sell what they are paid to sell. Annuities are hard to sell and therefore have large commissions. Olen details the behavioral finance techniques the insurance industry employs to sell these products, as well as the generous funding the industry gives to educational institutions like the University of Pennsylvania's Wharton School of Business. It turns out that listening to Jim Cramer's "Mad Money" can be costly. And the Rich Dad Academy is really just a high pressure sales tactic to get you to sign up for another paid course, which is intended to sell a more expensive course, and so on. It gets worse. The whole movement to teach financial literacy is filled with self-serving messaging from the financial services industry. While Olen gave some compelling examples, she left out what I feel is the ultimate example - the Stock Market Game. Sponsored by the large brokerage firms and starting in the elementary grades, kids are taught to pick a few stocks under the guise of investing. My 15-year old son has had to twice play this game of speculation in school. I think "Pound Foolish" does a great job in describing my industry and covers many of the same topics I've written about in CBS MoneyWatch and as the Mole in Money Magazine. In fact, I was surprised to see that my dog Max and I were mentioned in the book, retelling our experience when my dachshund puppy was awarded a plaque by the Consumers' Research Council of America as one of America's Top Financial Planners. After reading this book, I found myself even more depressed than normal when thinking about my illustrious industry. Other than the advice to start a discussion about our money, Olen offered no solutions, and I asked her why. I thought her answer was smart: She told me it would come across as hypocritical to write a book about self-serving financial advice and then give advice. That was food for thought, as I've both criticized my industry and given advice. 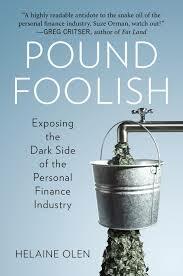 I found "Pound Foolish" both an accurate account of my industry and a very engaging book. I also agree that talking about money is a good thing. Still, though I've often been called a pessimist, even I don't think the situation is quite that hopeless. Many people can and do actually live below their means and get ahead by investing in simple low-cost diversified and transparent products.